Dental implants are a practical and long-term solution to missing teeth. Dental implants are a long-wearing replacement for missing or severely damaged teeth. When paired with a restoration, this revolutionary dental solution looks and feels just like your natural teeth, and can be used to correct aesthetic or functional problems. Dental implants are metal posts surgically inserted into your jawbone. Once placed, your dentist will mount replacement prosthetic teeth (usually crowns) on to the posts to restore form and function to your smile. Dental implants are a critical part of dentistry. Where teeth are lost, the bone underneath recedes and collapses – unfortunately this is also often the case with dentures and bridges. This poses a real threat to your oral health, including exposing you to infection and gum disease. Due to the nature of their insertion, dental implants integrate into the structure of your jawbone. The metal post acts as a tooth root and maintains the structure in the underlying bone. This is critical to a long-term dental solution. Dental implants allow you to speak and eat with ease. As they are secured, they don’t click or wobble like dentures, and will not move out of place. It is critical to address missing teeth as soon as possible in order to maximise oral health and prevent future dental issues. With proper care, dental implants can last for up to 25 years. While the metal post has the potential to last a lifetime with twice-yearly dental check-ups, the fixture on top, the crown, has a shorter life span. Due to daily wear and tear, a crown is positioned to last up to 15 years with excellent oral hygiene. The location of the implant and crown in the mouth also affect its lifespan. Those toward the back of the mouth receive more strain from chewing, and therefore have a shorter life expectancy than those at the front of the mouth. At United Dental Clinic we utilise three-dimensional implant planning software to virtually place the implant prior to surgery. This serves as a surgical guide, and allows for a more predictable implant placement with minimal surgical trauma. 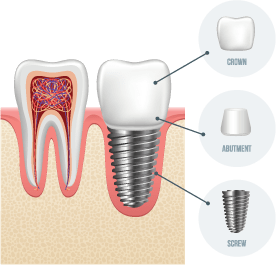 If you think dental implants could be the solution you’ve been searching for, contact us today!